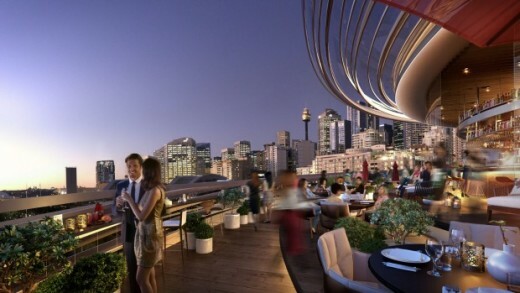 Sydney’s skyline is set for more cranes and a rooftop bar with the development of the Darling Exchange, in the heart of the $3.4 billion transformation of Darling Harbour. 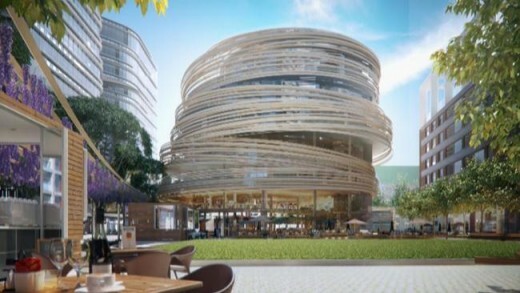 Located in the Darling Square neighbourhood of Darling Harbour, it will feature a community and lifestyle building that will be the new home of the City of Sydney’s library, an innovation exchange, a child care centre, open air retail at ground level and the bar on level 6. 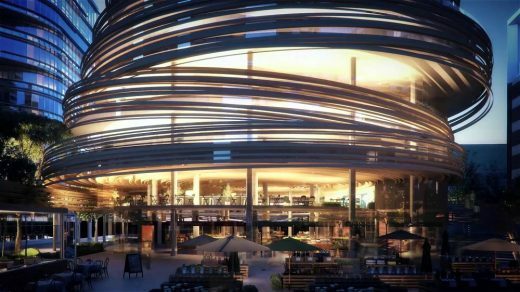 The six-storey circular building is designed by Japanese-based, Kengo Kuma Architects (KKA), with an adjoining public urban square designed by Aspect Studios. 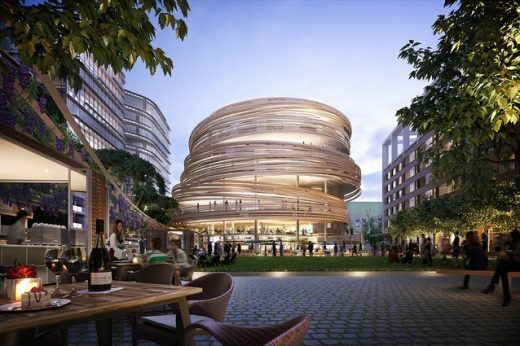 Kengo Kuma, founder and principal, KKA said, the wooden screen wraps the exterior of the Darling Exchange building “in a dynamic and exciting manner, a historical reference to Darling Harbour originally being a hive of business activity and a focal point as a market exchange”. 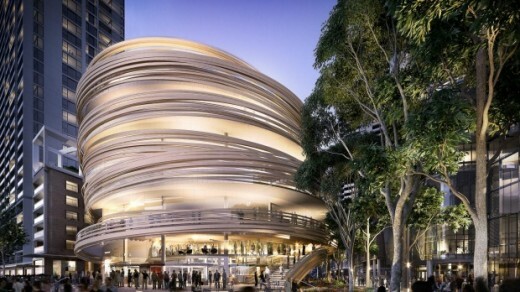 Does Darling Exchange’s unusual design deserve a special Sydney nickname? 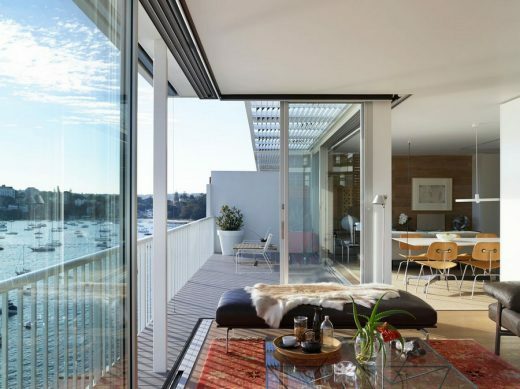 Have you say in the comments below. 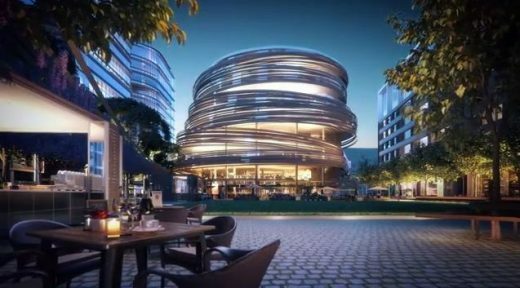 The adjoining new urban square will be an extension of the Darling Exchange building and includes areas for pop-up markets and retail, as well as green space for the public. 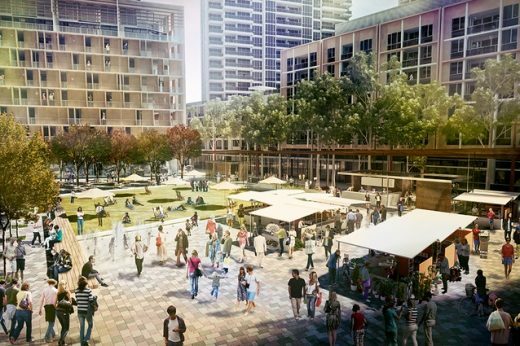 It is 2700 square metres (about the size of Martin Place between Pitt and George Streets), and is part of around 35 per cent of Darling Square that Lendlease is making available as public space. 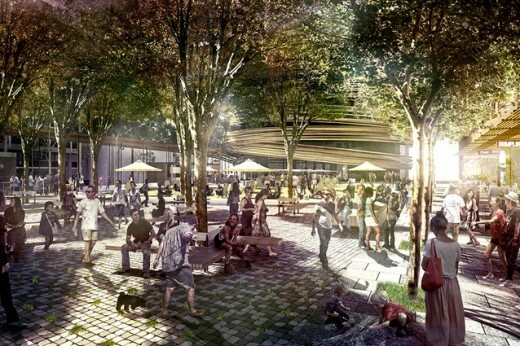 Once completed the Darling Square village will have around 4200 residents and 2500 workers as well as the Sydneysiders and tourists who are expected to visit the area.